December 7 & 8, 1956. 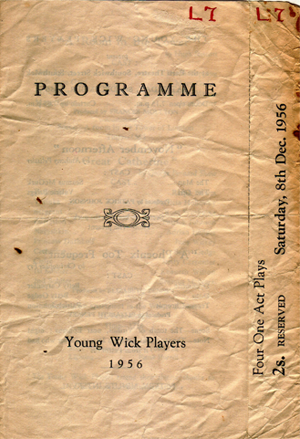 THE Young Wick Players provided a varied evening’s entertainment on Friday and Saturday with four one-act plays, two being Festival winners in 1954 and 1956. For me, Betty Gedge made the evening, first as the delightfully earthy Doto in Christopher Fry’s A Phoenix Too Frequent, and later in the evening as Catherine in George Bernard Shaw’s Great ; no mean feat. In the former the set and lighting were effective and the cast of three [Dynamene, by Betty Carpenter, and Tegeus-Chromis, by Patrick Johnson], under intelligent direction, made the most of their lines and enabled the audience to savour this comedy to the full. I was therefore a little disappointed to see that producer Elizabeth Penney, while able to reveal the subtleties of Fry’s humour, should fall down on the straightforward comedy of Shaw, for in the second main play there was just a little too much slapstick and over-acting, so that at times the effect was third-rate pantomime. Patrick Johnson, too, had a full part in this play, and I found myself getting a little tired of him: his voice lacks a wide enough dramatic range, and someone must tell him about his hands; excitement, emotion, emphasis – they were all signified by clenched fists on arms bent at the elbows. But he did put over some wonderful lines in his coy pose. Anthony Pelissier’s November Afternoon was an ideal curtain-raiser which was well conveyed by Seamus McGurk, Valerie Briggs will do better as her experience increases. A Room in the Tower, by Hugh Stewart, was a little too long for the second curtain-raiser and not, perhaps, a happy choice so soon after Southwick audiences had seen The Young Elizabeth. Mary Gedge was an attractive Lady Jane and Jean Porter an able Mary Tudor. Other parts in the plays were taken by Diana Topping [Tylney], Patricia Mason [Ellen], Ralph Dawes [Patiomkin], Patricia Holloway [Varinka], Derek Wass [ Sergeant’, Adrian Hedges [Naryshkin], Judy Wilkey [Princess Dashkoff], Betty Carpenter [Claire], Joseph Mohern and Seamus McGurk [soldiers]. Frances Moulton and Patrick Johnson produced the curtain-raisers. AUDIENCES at the Barn Theatre, Southwick, at the week-end enjoyed four plays presented by the Young Wick Players. The main part of the programme consisted of two one-act comedies – Christopher Fry’s A Phoenix To Frequent and George Bernard Shaw’s Great Catherine, both admirably produced by Elizabeth Penney. In these two lively pieces, there was some outstanding acting from Betty Gedge, playing Doto in the Fry triolet, with Betty Carpenter [Dynamene] and Patrick Johnson [Tegeus-Chromis], and Catherine in Shaw’s satire set in 18th Century Russia. Each of the comedies was preceded by a curtain-raiser in contrasting serious mood – Anthony Pelissier’s sad little park bench meeting between a girl and a blind man in November Afternoon [Valerie Briggs and Seamus McGurk], produced by Patrick Johnson, and Hugh Stewart’s all-women period playlet, A Room in the Tower, performed by Diana Topping, Mary Gedge, Patricia Mason and Jean Porter, under the direction of Frances Moulton. Those taking part in Great Catherine included Ralph Dawes, Patricia Holloway, Derek Ross, Patrick Johnson, Adrian Hedges, Judy Wilkey, Betty Gedge, Betty Carpenter, Joseph Moherne and Seamus McGurk.